Smoking is one of the very worst things you can do to your body. At this point, everyone is well aware of the health risks they run by smoking. Heart disease, lung cancer and emphysema are just a few of the deadly dangers that people face when they continue to smoke. That’s why it’s so important that people find effective ways to quit smoking as soon as possible. The oldest method of quitting smoking is still one many people try. Around 90 percent of people still try quitting cold turkey. Going cold turkey means you simply put the cigarettes down one day and quit forever through willpower alone. Unfortunately, not many people find quitting smoking cigarettes cold turkey a very effective method. Only around four to seven percent of people are able to successfully quit smoking by going cold turkey. If you feel like your willpower is strong enough to quit smoking cold turkey, there are things you can do to up your odds of being successful. Try to get plenty of exercise and stay busy. Boredom is one of the easiest ways to find yourself craving a smoke. You should drink plenty of water, eat healthy foods and avoid alcohol and other drugs to increase your chances of success. One of the most exciting new methods to quit smoking is using nicotine replacement therapy. This is a very effective method that will greatly increase your chances of quitting smoking rather than trying to do it through willpower alone. Statistics show that people who use nicotine replacement therapy to help them quit smoking are 50 to 70 percent more likely to be successful than those who don’t. A nicotine replacement therapy is basically a method of weaning yourself off nicotine without having to suffer cravings. There are many delivery methods you can use for nicotine replacement therapy, including nicotine gum, inhalants, patches, lozenges and sprays. With most of these delivery methods, former smokers simply use the nicotine replacement therapy whenever they feel a craving. This gives them a controlled dose of nicotine that allows them to calm their cravings without suffering the nasty effects of smoking. However, the nicotine patch is different than the other nicotine replacement therapies. With the patch, you wear it all day long. The patch delivers your body a time-released, steady dose of nicotine that reduces or even completely eliminates your cravings. All nicotine replacement therapies are very effective at helping people to quit smoking. If you are under 18, you will need your doctor’s permission to use them. Otherwise, you can just go into any drug store and buy them without a prescription. There are also prescription medications available to help you quit smoking. 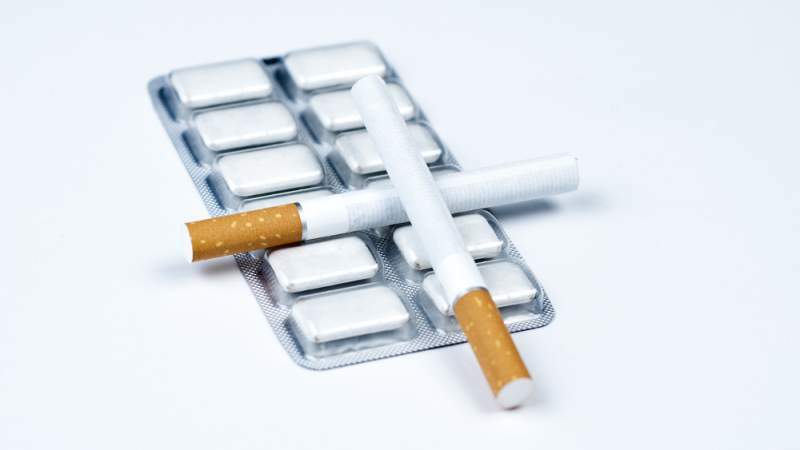 Two of the latest medications to quit smoking cessation are varenicline (Chantix) and bupropion (Zyban). Bupropion works by lessening your desire to smoke. You start taking it a week or two before the date you set for quitting. This is because it takes a while for the drug to build up in your system. Once it has built up, you will find that you suddenly find your urge to smoke diminishing. It can really feel like magic for people who have struggled with quitting smoking for years. Almost with no effort, you will find that you can put down the cigarettes for good without facing the nasty cravings and irritability that normally accompany trying to quit. Varenicline also reduces your desire to smoke. It works by binding to a brain receptor with the catchy name of α4β2 acetylcholine. This brain receptor is one of the reasons that people find smoking so enjoyable. When nicotine enters the system, it activates this receptor and triggers a pleasurable feeling in users. Varenicline also activates α4β2 acetylcholine, but it only partially does it. Because it is already activating the receptor, anyone who smokes when they have varenicline in their system will not experience the pleasure they normally get from smoking. This quickly helps them to put down cigarettes as their body no longer rewards them with satisfaction for lighting up. Just as with bupropion, it takes a while for varenicline to build up in the system. You will also need to start taking it one or two weeks before the date you have set to quit smoking. If you do that, you will find that you no longer have much or any desire to smoke anymore thanks to the α4β2 acetylcholine receptor being blocked by the varenicline. An interesting new method you can use to help you quit smoking is behavioral therapy. With the help of a trained psychologist or psychiatrist, you can modify any negative behavior you engage in, including smoking. Your behavioral therapist will help you to identify people, things and situations in your life that act as triggers that make you reach for a cigarette. The therapist will help you both to find ways to avoid these triggers and to deal with cravings when do you encounter them. Sometimes people have trouble quitting even when they have tried every conventional method available. For these people who cannot seem to put the cigarettes down for good no matter what they do, hypnosis may be the answer they’re looking for. During hypnotherapy, the therapist will use relaxation techniques to put you in a calm, mellow state of mind during which you will be extremely susceptible to suggestion. The hypnotherapist then will plant thoughts in your unconscious mind about the dangers of smoking or how disgusting it is. Once you have these thoughts implanted in your subconscious, they will activate every time you try to reach for a cigarette. Your subconscious mind will hopefully keep you from smoking, thanks to the hypnosis. Hypnosis doesn’t work for everyone, but it can often be surprisingly effective for people who have struggled to quit smoking for years using many other methods. It’s definitely worth a try if you are finding it impossible to quit by using anything else. Quitting smoking is hard, but don’t give up. You can do it with the help of these methods. The key is to keep trying until you find the method or combo of methods that is right for you. You can up your chances of quitting by talking with your doctor. You will have to meet with your doctor anyway if you want to get the latest medications to quit smoking like Chantix and Zyban. Use your doctor’s knowledge to help you develop the most powerful anti-smoking program to help ensure you quit smoking for good.